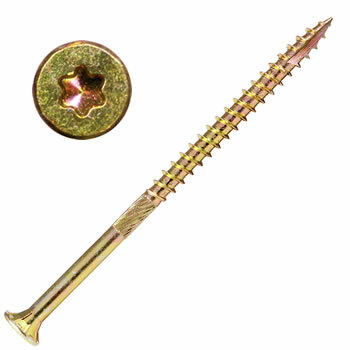 10 X 3-1/2-inch Heavy Duty Gold Star Star Drive Interior Multi Purpose Wood Screws / 1M per carton approx. Includes Free T-25 Bit Self countersinking, flat head with cutting nibs, extra sharp type 17 auger point, large knurled shank, deep - wider sharp threads w/spiral notches, yellow zinc coating, hardened steel. (See our Silver Star Stainless Steel wood screws line for use with Cedar and Redwood).